It’s understandable if you’re under this impression, as the size of your monthly benefits does indeed depend on when you begin receiving checks. If you do so at the earliest possible moment — that is, the month after turning 62 — then your monthly take will be 25% less than had you waited until full retirement at 66. Furthermore, if you wait until turning 70 then you’ll receive delayed retirement credits. This adds 8% a year to your monthly check for as many as 3 years. The net result is that you could end up receiving 32% more each month than your primary insurance amount (what you’re entitled to at age 66) and 76% more than if you elected to receive benefits at 62. But while these numbers are impressive, it’s not the end of the analysis. This is because there’s a large cost associated with waiting; if you start receiving benefits at 62 as opposed to 70, then you get monthly checks for a full eight more years. The question, in turn, is whether (and, more specifically, when) the cost of waiting outweighs the benefit of a higher but delayed monthly check. This is known as a break-even analysis. 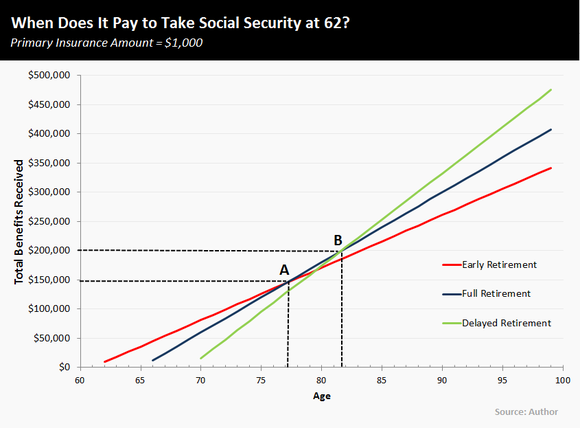 And while there are calculators for this purpose online, here’s the gist of it: If you expect to live past 77, then you should wait until full retirement age to begin collecting benefits, as it’s at this point when the gain from waiting overtakes the cumulative cost — see “A” in the preceding chart. Moreover, if you realistically see yourself living past 82, then it would also behoove you to wait until you’re 70 years old. The rational is the same; by that point (see “B” in the chart below), your cumulative benefits from waiting will add up to $206,000 compared to $204,000 had you elected to receive benefits at 66 and $189,000 had you begun drawing from the system at 62 — this is assuming a primary insurance amount of $1,000. But here’s the thing that’s important, if not a bit morbid, to keep in mind: According to the latest data, the average lifespan of an American is 79.8 years old. And for men, it’s only 77.4 years compared to 82.2 years for women. Thus, based on age alone, and particularly for males, it’s probably not as smart as you might at first think to hold out for larger Social Security checks. Now, just to be clear, there are a number of additional variables that should factor into one’s decision about when to apply for benefits. If you’re planning to work between the ages of 62 and 66, for instance, the scale tips in favor of deferment, as wages above a certain threshold will erode your Social Security benefits until you reach full retirement. And the same can be said if you have a spouse or other dependents that are likely to outlive you. The net result would be to extend the life (and thus value) of your cumulative benefits. Ultimately, the point here is that if you find yourself in a position to apply for benefits early, rest assured that there’s little reason not to. Social Security plays a key role in your financial security, but it’s not the only way to boost your retirement income. In our brand-new free report, our retirement experts give their insight on a simple strategy to take advantage of a little-known IRS rule that can help ensure a more comfortable retirement for you and your family. Click here to get your copy today.